I hate crying. I hate it even more when I cry in public and as much as I want to stop myself from crying, I can't. I pretend that there's just something that was caught in my eye but my friends would know that I'm crying. I'm a crybaby. It's ironic coz I'm always the first to dish a bitchy line or 2 ... okay, more like 100 bitchy lines but deep inside, I'm a crybaby. I easily cry especially when it involves people that I love and people that I value. I can't help it. I don't easily care about someone but when I do, I really give it my all. This is not just to a significant other but to friends and family as well. 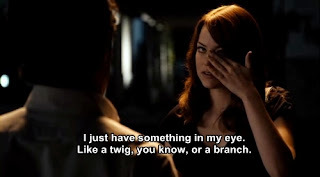 So whenever something really hurts me and I end up tearing, I just say, "I have something in my eye, you know, like a twig ... or a branch."